This week we are flaunting any cut from the Twinkle Toes cartridge. 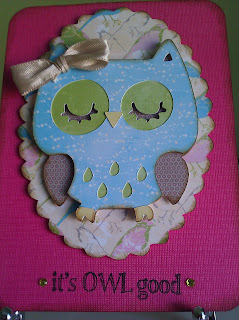 I don't have that cartridge so I am using the owl from Create a Critter. I cut her out on my Imagine, using the Blossom pattern cartridge. The Imagine makes it so easy to cut all of the pieces with different patterns - I love it! :) Be sure to stop by the FIF blog and check out the projects from all the other awesome ladies! !